Hello and happy Friday everybody. It's a gloomy, cloudy, frosty day here in Spokane with more snow predicted for tonight and tomorrow but it's nice and cozy inside my home. and this. I just took these outside the window and it's 1:30 in the afternoon. I don't think it will be melting off today. It IS pretty though, isn't it? Both of these are the wind chimes that Dennis made me a few years ago. And this is my view from my chair. It's nice and cozy inside by the fire. You can see how brightly it's burning with the door open. With the door shut it's much more muted but still warm. :-). Does anyone know an easy way to clean the creosote buildup off of the glass doors? Chloe likes the fire too and is my constant companion. I've been busy knitting mittens. I want to get a start on next years batch. I also made a pair of grey 100% wool mittens for Paul, our friend from the lake. I would show you a picture but I forgot to take one and he already has them. It's been a quiet couple of days here. I haven't left the house in two days and that hasn't bothered me one little bit. I love to be home. I have a fire, my dog and my knitting. What else could a girl want? Except to have my sweet husband come home to me after a long day of work. I. Am. Blessed. Beyond measure, I am blessed. 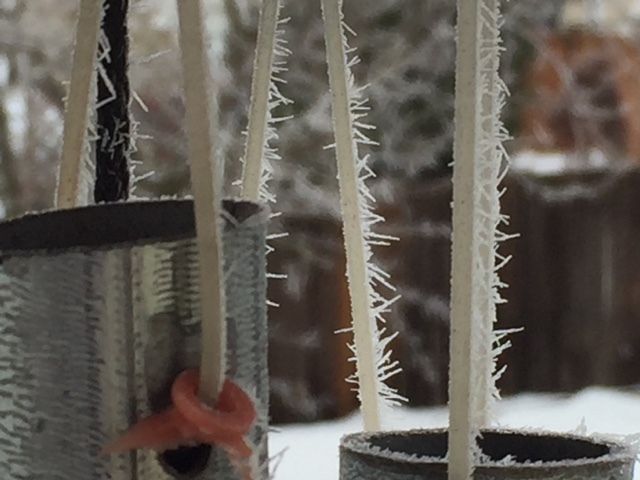 Your hoar frost pictures are beautiful...better than the weather channel who was showing it the other day. I used to clean my door on my wood burner with Windex but maybe mine was just smoke and not creosote? Of course...it goes without saying to wait until it is cooled off..lol! 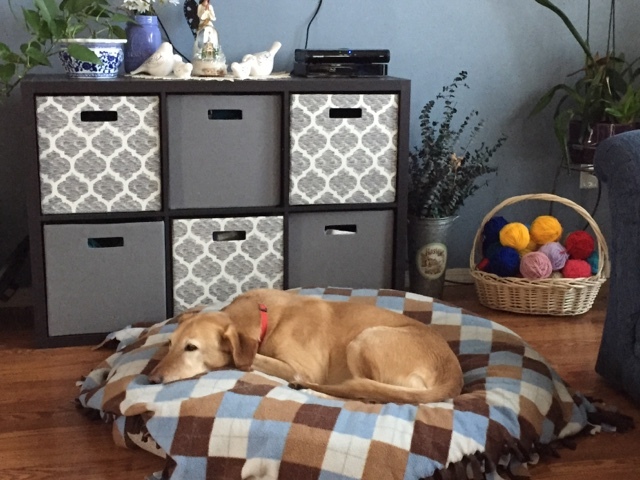 I love your dog's bed....Nitty could use a new one but for her size they're like $60.00 so I've been putting it off...for years! She needs a bigger one like the one Chloe has. I am like you...I love staying home and doing domestic chores and puttering around the house. Probably because I never got to do it while I was working all those years. It's fun now but I don't have all those years of practice so I'm not very good at it! LOL! Love the mittens as always! Have a nice weekend. I did try winded but it didn't do a thing. Hloe's bed is from Costco with a fleece blanket thrown on top so it's easy to wash. She loves it. I think it was about $30.00. I worked full time until 7 years or so ago so I truly love being home now too. It is pretty but I much prefer warm weather. We have a vacation planned in a couple of weeks that I'll tell you all about next week. I can't wait! Becky, Thank you so much for reading AND for commenting. I'll be sure to try the ash and paper towel after the fire cools off! I appreciate the suggestion. do miss our wood burning stove. 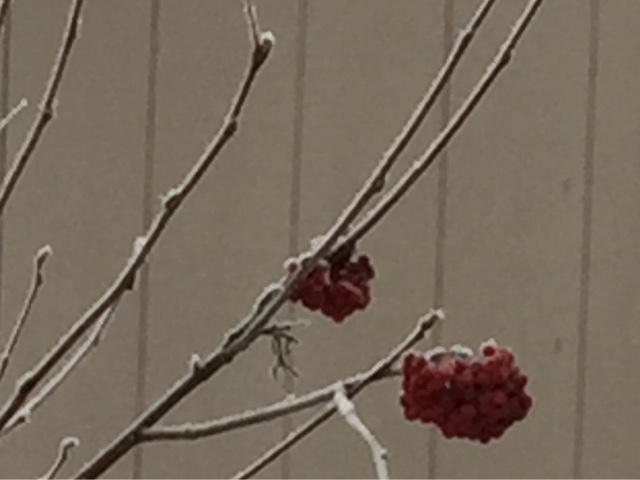 Love your photos of hoar frost. Thank you Gil. I've never had one before and I do enjoy it. Stay in an stay warm!!!!! Looks ever so cozy! Any chance of getting your mittens pattern? 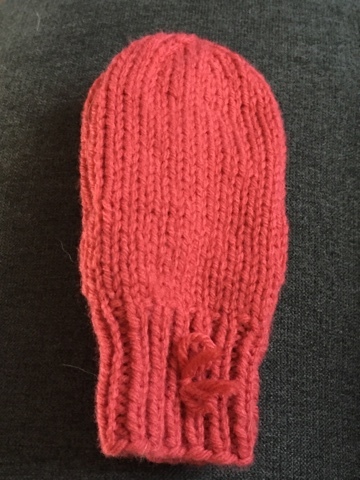 I haven't knitted mittens before, but would like to try. I would be happy to send it to you!! Just email your address to me at queenbetsy2@gmail.com. Hi Betsy, My first time responding to your blog, love it by the way. 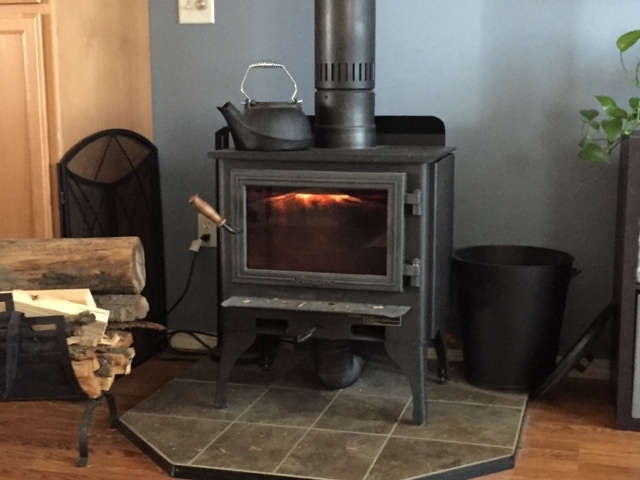 I have a woodstove also and I have always cleaned it with a mixture of baking soda and water. Just make a paste and rub it on with paper towel, rinse with clean water and tada! Works wonderfully and no harsh chemicals or mess. Hi Betsy. I have a stove and use the ash to clean the glass with damp newspaper and then buff it off with a cloth. Hope that helps. Thanks! I used ash and a paper towel this morning and it helped a lot. Need to do a better job later. WOW! That was my first thought when I saw that frost. That is beautiful!! This is how I've always seen creosote removed from glass: http://www.ehow.com/how_5934922_remove-creosote-glass.html I hope it works for you! Thanks for visiting Lesley Ann. I'll check out that link. Thank you. Baby it's cold outside! 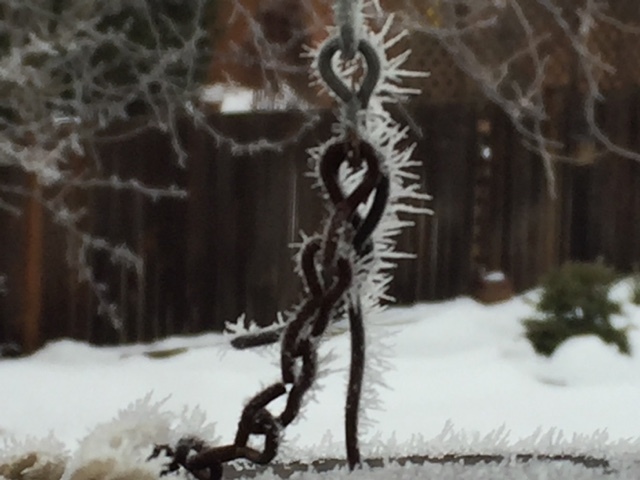 Hoarfrost is pretty. Sorry it's been so cold there. We've got a week of rain ahead of us. It was cool and did rain some today. I'm just trying to get re=organized after being the holidays and not feeling good and tired....when will it ever be better? I guess I need to just do it! Happy and blessed weekend, my friend! It IS cold. Hope you feel better soon. I definitely know that feeling. Easy creosote removal that works for us: the next day when the unit is cold spray the glass with windex (or similar) then scrub off with a soft scrub pad. I buy the cheap green ones at the dollar store, and cut them in half, making then last even longer. It works well for us, and once the build up is gone you can also just use windex and newspaper to clean it off, using the scrub pad for tough spots. Good luck with it! Thanks for the suggestion! It sounds easy. Two days at home with a fire, a cozy dog and knitting sounds like bliss to me. Can I come over? I clean my fireplace glass with simple glass cleaner and a rag, it comes off nicely. Hugs to you and stay warm Betsy. Come on over Meredith! You would be very welcome. I use a single edge razor blade scraper to clean my glass, and then just wipe anything left with windex and a paper towel. Works great! I like winter days in front of the stove with knitting in hand and a nice cup of tea. The razor blade is a method I hadn't heard before. Thank you for the suggestion. I have lots of things to try now. Also I heat with a wood stove also and I use paper towel and a sponge with a bit of that green scratchy stuff from the dollor store, and newspaper, and you use a bit of ash from the stove and it comes off well, but what a mess. Then I use a bit of widow cleaner. Sometimes it has been really bad and I have used a sos pad! I'm so glad you stopped in to visit Roxy. I hope you come back and visit often. 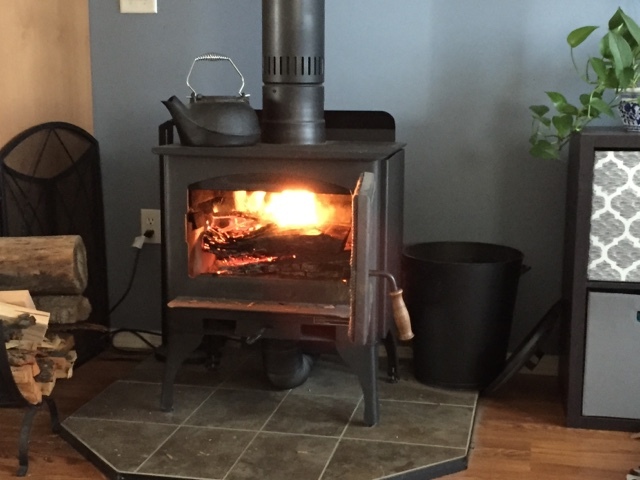 I've gotten some very good cleaning tips for the wood stove and I'm going to try some of them soon. Thank you for yours!